Liczba stron: 1086 Jest to ujednolicona liczba stron, która ułatwi Ci porównanie długości książek. Każda strona Legimi to 200 słów. 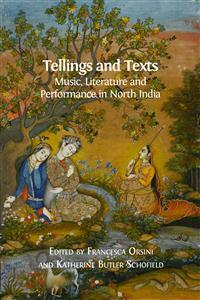 Examining materials from early modern and contemporary North India and Pakistan, Tellings and Texts brings together seventeen first-rate papers on the relations between written and oral texts, their performance, and the musical traditions these performances have entailed. The contributions from some of the best scholars in the field cover a wide range of literary genres and social and cultural contexts across the region.The texts and practices are contextualized in relation to the broader social and political background in which they emerged, showing how religious affiliations, caste dynamics and political concerns played a role in shaping social identities as well as aesthetic sensibilities. By doing so this book sheds light into theoretical issues of more general significance, such as textual versus oral norms; the features of oral performance and improvisation; the role of the text in performance; the aesthetics and social dimension of performance; the significance of space in performance history and important considerations on repertoires of story-telling. The book also contains links to audio files of some of the works discussed in the text.Tellings and Texts is essential reading for anyone with an interest in South Asian culture and, more generally, in the theory and practice of oral literature, performance and story-telling. King’s College London has generously contributed to the publication of this volume. Cover image: Late eighteenth-century miniature by Mir Kalan Khan (Awadh, c.1775). Photo by Pernille Klemp. © The David Collection, Copenhagen. Inventory no. 50/1981. All rights reserved. Cover design by Heidi Coburn. All paper used by Open Book Publishers is SFI (Sustainable Forestry Initiative) and PEFC (Programme for the Endorsement of Forest Certification Schemes) Certified. Did Surdas Perform the Bhāgavata-purāṇa? This volume brings together the papers presented at the third and final conference of the AHRC-funded project “North Indian Literary Culture and History from a Multilingual Perspective: 1450-1650”, which Francesca ran at the School of Oriental and African Studies (SOAS) between 2006-2009 and in which Katherine was intimately involved from start to finish. The conference was initially entitled “Tellings, Not Texts”, but over the course of the three days it became clear that texts were very much involved in many of the performance forms and traditions we were discussing, hence the change of title. (The first conference volume, After Timur Left, came out in 2014 from Oxford University Press, New Delhi, co-edited by Francesca and Samira Sheikh.) We would first of all like to thank the AHRC for its generous support. The conference, which took place on 8-10 June 2009, benefited from a British Academy conference support grant, for which we are also grateful, as we are to the European Research Council which supported Katherine’s contributions in the latter stages. We would like here to heartily thank all the contributors for their patience and good humour as we asked for more and more changes. We thank Alessandra Tosi for her enthusiasm and welcome, and Dr David Lunn for careful copy-editing. Our dear friend Aditya Behl helped plan the conference and was supposed to come, but was in the end too ill to travel. He died, tragically young, two months later. We would like to dedicate the volume to him, for he remains in our thoughts and in our love. A volume of this kind inevitably has a large number of transliterated words in several languages. To make the text readable without sacrificing its scholarly appeal, we have chosen to use diacritical marks for book titles and direct quotations, and to keep them to a minimum elsewhere; in some instances, notably where metrical considerations are important, they are used more extensively. For Devanagari, the transliteration used follows R.S. McGregor, The Oxford Hindi-English Dictionary (New Delhi: Oxford University Press, 1993), with the exception that nasalised vowels are transliterated with a ṃ instead of ṁ. For Persian words, we have slightly adapted existing systems as below. In spite of our efforts, we have not achieved complete consistency. This volume necessarily makes reference to four discrete calendrical systems. Where otherwise unmarked, we use the Common/Christian Era (Anno Domini), denoted “CE”. The Islamic calendar (denoted “AH”: Anno Hegirae, or Hijri year), commenced in the year 622 CE. A lunar calendar, it does not correspond directly to the Gregorian Calendar, and the year 2015 CE is 1436-37 AH. The Vikram Samvat calendar, denoted “VS”, is between 56-57 years ahead of the Common Era, thus 2015 CE covers 2071-72 VS. Finally, the Banggabda or Bengali Calendar, denoted “BA”, is between 593-94 years behind the Common Era, thus 2015 CE is 1421-22 BA. Both VS and BA are solar calendars, but do not begin in January, so there is no precise overlap with CE. (L) Jnaneshwari Stamp, issued in 1990 to commemorate the 700th anniversary of the composition of the Jñāneśvarī; (R) “Saint Dnyaneshwar” stamp, issued in 1997 in memory of Jnaneswhar/Jnandev. Public Domain. Namdev Performing a Kirtan, folio from a nineteenth-century publication of Mahipati’s eighteenth-century biography . Public Domain. Four typical badas or “notebooks” in the collection of the Bhandarkar Oriental Research Institute. Author’s photograph, CC BY. Transcript of a kirtan from a Marathi bada, c. eighteenth century. Bhandarkar Oriental Research Institute. Author’s photograph, CC BY. A representative page from Lohiya, K. 1997. Kirtan mārga darśikā (Pune: Sharada Sahitya), pp. 194-95. All rights reserved. (L) section is taken from the Śrī Nāmdev gāthā (1970), p. 343; (R) is taken from the Bhaktavijay 1996 , pp. 164-65. Image by the author, CC BY. Dapha group performing in Suryamarhi Square, Bhaktapur. September 2007. Author’s photograph, CC BY. Raga Lalit. Bhaktapur, early seventeenth century. Photograph by Gert-Matthias Wegner, CC BY. Dapha group performing at the Taleju temple, Kathmandu, in 1664. Detail of a painting now in the Collège de France, Paris. Author’s sketch, CC BY. Ganamani. Dattatreya Navadapha songbook, song no. 63 (fol. 20r-20v). Public Domain. One side of the Bhairav Navadapha group performing on the first day of Biskah, Tahmarhi Square, Bhaktapur. The chariot of Bhairav is visible behind the singers. April 2003. Author’s photograph, CC BY. Imre Bangha is Associate Professor of Hindi at the University of Oxford. He studied Indology in Budapest and holds a PhD in Hindi from Visva-Bharati. His publications include English, Hindi, and Hungarian books and articles on Brajbhasha and other forms of early Hindi with special focus on the poetic works of Anandghan, Thakur, Vishnudas, Tulsidas, Kabir, and Bajid, as well as on Rekhta literature in the Nagari script. Amy Bard teaches Urdu and Hindi language and literature at Harvard University. In addition to her work on Shi’i religiosity, Bard’s current projects include translating contemporary memoirs and autobiographical fiction from Hindi and Urdu to English. Allison Busch is Associate Professor in the Department of Middle Eastern, South Asian, and African Studies at Columbia University. Her expertise is in Hindi literature, and she also has a special interest in Mughal-period court culture. Her recent monograph Poetry of Kings came out from Oxford University Press in 2011. Professor Busch is the editor (with Thomas de Bruijn) of Culture and Circulation: Literature in Motion in Early Modern India (2014), a collection of essays that explores relationships across literary languages in South Asia. One ongoing research project concerns the historical poetry produced in Rajput kingdoms during the heyday of Mughal rule. She is also working (with the art historian Molly Aitken) on a book about aesthetic representations of the Indian heroine across the arts. John E. Cort is Professor of Asian and Comparative Religions at Denison University in Granville, Ohio. He is the author of Jains in the World: Religious Values and Ideology in India (2001), Framing the Jina: Narratives of Icons and Idols in Jain History (2010), and, with Lawrence A. Babb and Michael W. Meister, Desert Temples: Sacred Centers of Rajasthan in Historical, Art-Historical and Social Contexts (2008), as well as many articles on the Jains and on religion and culture in western India. He has edited Open Boundaries: Jain Communities and Cultures in Indian History (1998) and, with Andrea Luithle-Hardenberg and Leslie C. Orr, the forthcoming Cooperation and Competition, Conflict and Contribution: The Jain Community, British Expansion, and Jainological Scholarship, 1800-1950. Thibaut d’Hubert is assistant professor at the University of Chicago where he teaches Bengali language and literature in the Department of South Asian Languages and Civilizations. His main field of research is the literary history of Bengal. His research interests include Indic and Persian poetics, the editing of premodern Bengali texts, the study of scribal practices, South Asian traditional hermeneutics, and the history of translation. He is currently working on a book project on the Bengali poet Alaol (fl.1651-1671) and the formation of vernacular Muslim literatures around the Bay of Bengal (c. sixteenth–seventeenth centuries). With Alexandre Papas (CNRS/CETOBAC, Paris), he is preparing a handbook on the reception of the works of the Persian polymath of Herat ‘Abd al-Rahman Jami (1414-1492) based on material presented by various scholars during two conferences held in Chicago (2012) and Paris (2013). Christian Lee Novetzke is Professor of South Asia Studies, Comparative Religion, and International Studies at the Jackson School of International Studies at the University of Washington, Seattle. His work explores the histories, cultures, and religions of South Asia from the medieval period to the modern and contemporary. Novetzke’s work includes three books: Religion and Public Memory (2008 and 2009); The Quotidian Revolution: Vernacularization, Religion, and Everyday Life in Premodern India (2017); and Amar Akbar Anthony: Bollywood, Brotherhood, and the Nation, written with Andy Rotman and William Elison (2016). Francesca Orsini is Professor of Hindi and South Asian Literature at the School of Oriental and African Studies, University of London. Her research spans modern and contemporary Hindi literature (The Hindi Public Sphere: Language and Literature in the Age of Nationalism, 2002), cultural history (she edited Love in South Asia: A Cultural History, 2006), popular literature and the history of the book (Print and Pleasure: The Genres of Commercial Publishing in Nineteenth-century North India, 2009), and multilingual literary history (Hindi and Urdu Before the Divide, 2010; After Timur Left: Culture and Circulation in Fifteenth-century North India, co-edited with S. Sheikh, 2014). Stefano Pellò is Lecturer in Persian and Indo-Persian studies at the University “Ca’ Foscari” of Venice, and has been Visiting Lecturer at the School of Oriental and African Studies in London and at Columbia University, New York. His main research area is currently the diffusion and reception of Persian linguistic and literary culture in and beyond South Asia, and the related cosmopolitan processes of cultural and aesthetic interaction, particularly in the poetic sphere. He has also published studies on the traditional Persian philological and rhetorical disciplines and works as a literary translator. Among his main publications are Tutiyān-e Hind, a book on the history of Persian grammatical writings(Dabistan-i Parsi: Una grammatica persiana del XIX secolo,2003), and the first Italian complete annotated translation of the Divan of Hafez of Shiraz (2005). Katherine Butler Schofield (née Brown) is a historian of music in Mughal India and the colonial Indian Ocean. Working largely with Persian sources for Hindustani music c.1570-1860, she has established music as central to Mughal technologies of sovereignty and selfhood, identified classicisation processes at work in early modern Indian arts, examined the role of connoisseurship in nourishing male friendships, told tales about ill-fated courtesans and overweening ustads, and traced the lineage of the chief musicians to the Mughal emperors from Akbar to Bahadur Shah Zafar. Her current European Research Council project, “Musical Transitions to European Colonialism in the Eastern Indian Ocean” (2011-2015), investigates the ways in which the musical field was transformed in India and the Malay world c.1750-1900 as pre-colonial polities gave way to colonial regimes. As part of this project she is co-writing a book, Hindustani Music Between Empires: Alternative Histories. Sunil Sharma is Professor of Persianate and Comparative Literature at Boston University. He received his PhD from the University of Chicago. He is the author of two monographs: Persian Poetry at the Indian Frontier: Mas‘ūd Sa‘d Salmān of Lahore (2000) and Amir Khusraw: The Poet of Sultans and Sufis (2005); two collaborative works: Atiya’s Journeys: A Muslim Woman from Colonial Bombay to Edwardian Britain (2010) and In the Bazaar of Love: The Selected Poetry of Amir Khusrau (2011); and co-editor of two volumes of essays: Necklace of the Pleiades: Studies in Persian Literature Presented to Heshmat Moayyad on his 80th Birthday (2007) and On the Wonders of Land and Sea: Persianate Travel Writing (2013). He has written numerous articles and co-curated several exhibitions at Harvard University. His research interests are in the areas of Persianate literary and visual cultures, translation, and travel writing. What would an auditory history of South Asia sound like? As we walk down a city street or a neighbourhood lane in contemporary India, loudspeakers hanging from electricity poles spread the tune of a choral bhajan or amateur singing at a ritual wake, while few neighbourhoods are out of aural reach of an azan, the call to prayer. Public spaces are routinely occupied by religious processions with drums, marriage processions with band baja, or political demonstrations with loud slogans and public speeches.Every town has public spaces—a maidan, lila ground, karbala, or park—where religious performances and “programmes”, fairs (melas), and political ralliesregularly attract visitors and broadcast their activities through their lively noises. Amidst the cacophony of traffic sounds—extra-loud car horns, shrill cycle-rickshaw bells, the deeper grumble of buses and trucks—people’s mobile ringtones advertise their musical taste: Punjabi beats, melodious ghazals, or the latest Bombay dance number. Several times a day, when your own mobile rings and you pick up, a jingle or a verse addresses you for no apparent reason. This soundscape is not static and unchanging. On the Delhi metro, the bilingual warnings “metro paridhan ko ganda karna ek dandaniy apradh hai” and “mind the gap” have replaced the scratchy audio cassettes on buses as accompaniments on one’s daily journey through the city, while fewer autorickshaws seem to ride with their radio on full-blast. South Asia’s visual culture has been the object of much study in recent years, from calendar art to photography, from truck art to political statuary. Yet it would be hard to deny that making sound and hearing or listening to music, songs, speeches, sermons, and stories have been equally constitutive of South Asian social and cultural history until the present day.2 But how has the mosaic of sounds, voices, and tellings changed over time? More fundamentally, how can we even write the history of sound at all, given that its nature is ephemeral: over in a moment, gone forever, and never fully captured in words on a page? This volume explores the interconnected histories of singing, storytelling, and oral performance in early modern and contemporary North India (and Pakistan), in an attempt to restore the auditory realm to the literary and cultural history of South Asia. It does not aim at comprehensive coverage—there is no essay that deals with the rich performance traditions of Punjab, for example3—but presents strategically identified case studies that show different uses of texts in performance, give an idea of the wide range of performance practices, and highlight the significant circulation of aesthetic concepts and ideas about the beneficial effects of music, singing, and storytelling. In this volume, therefore, we undertake a task that has not, to our knowledge, been attempted before for the literary cultures of North India.9 We seek to theorise the deep interdependencies of written text, sound, performer, audience, and meaning that the case studies in this volume make audible, in a situation where in most cases we no longer possess nor can ever recover the soundedness of the texts with which we work (see Schofield in this volume). By and large, texts that were once recited, sung, danced, and enacted have been territory ceded to scholars of literature and religion, who have generally acknowledged their aural and performative dimensions but gone little further.10 The aural domain, in turn, has been relegated to ethnomusicologists studying the highly exclusive soundworld of North Indian art music.11 And the very few ethnomusicologists who have brought tools of sonic analysis to bear on the textual archive have restricted their studies to instrumental genres and raga examples, whose mnemonic notation systems have been easier to translate, if only partially, into sound.12 Perhaps concerned that their literary understanding might be found wanting, or perhaps because of the sheer inaudibility of most historical texts, music historians have steered clear of explaining how poems subtitled with raga and tala names might have sounded, or what other sonic hints might tell us about the lives of North Indian texts as they circulated as sounded and embodied entities in a resonant world. General accounts of orality in South Asia typically begin with the oral-mnemonic tradition of Vedic and post-Vedic knowledge (the Upanishads, Panini’s grammar, etc.). But as Sheldon Pollock has pointed out, this much touted orality, while undoubtedly and bedazzingly true, has too often been taken as emblematic of a general Indian “indifference” to writing. The cultural premium on memorised knowledge (kanthastha or “held in the throat”, as Pollock reminds us) “left indelible traces in secular written culture”. And “from the moment writing was invented literary culture, the culture of kavya, became indissolubly connected to writing, so much so that the history of the one becomes unintelligible without taking into account the history of the other”.14 Similarly, Richard Widdess has noted that although there has been perhaps an even stronger emphasis placed on the superiority of oral-aural modes of transmission in Indian musical discourse, “many systems of ‘oral notation’ exist, and have existed since ancient times. These systems use solmization or other mnemonic syllables, and are primarily recited or sung, although they can also be written down”—and have been used to notate musical examples in written treatises since the Gupta period.15 Like Pollock, Stuart Blackburn notes of South India that even the early Sangam corpus of Tamil poetry (third century CE, but edited and anthologised only in the eighth) valorises both orality and writing: “Many of the poems are presented as if spoken or sung by bards, while, on the other hand, many give prominence to the role of the poet-scholar (pulavar)”.16 Both Blackburn and Pollock note the endurance of practices of orality in South Asia “as both fact and ideal” well into the modern period, and their persistence into the present day is particularly obvious in their continuing predominance in music pedagogy.17 Christian Novetzke notes that pre-modern sants and performers in Maharashtra lived in a milieu where literacy was a fairly ordinary and widespread skill. Yet the public culture of bhaktiand the logic of performance meant that, though literate, kirtankars would still privilege orality. In fact, as he puts it, the kirtankar “might be considered an intermediary between text and orality” (p. 180). The same is true of many of the performance practices covered in this book: singing, poetic recitation, and storytelling. Conversely, the mere physical presence of a book during a performance—even if it is not consulted—may work symbolically as an authorising gesture, as Widdess shows in his essay. Methodologically, however, although scholars of literature and religion concerned with the past are aware of the all-important oral dimension of performance, and ethnomusicologists and scholars of orality recognise that the living traditions they study are part of cultural and literary fields that have much longer histories, by and large it is difficult for one person to have the technical training to do both. The documents we have from the past—written texts, manuscripts, visual images, and written descriptions—often bear only scant traces of their oral-performative contexts, or else describe them in terms that are minimal or opaque, as in the musical notation of ragas or attempts to describe aesthetic experience. Conversely, current performance traditions that have been orally transmitted, especially the further we move from institutional centres, often bear only oblique traces of their history.20 We will come back to the relationship between texts/books and orality below. Trying to reconstruct the oral-performative history of early modern North India, as this book tries to do, presents additional challenges. While certain aspects have been well studied—bhaktisayings, songs, and performances; the circulation of songs and singers in devotional circles and across North Indian courts (especially the Mughal imperial court); sufi romances in Hindavi21—others remain unclear. Texts of the time often contain lively religious discussions, goshtis, and repartees, but what relationship do those iconic representations bear to real events and/or practices? Numerous musical treatises contain notated raga examples, but what do these actually tell us about how the ragas sounded in performance? Many texts that suggest concurrent oral-performative practices such as Puranas or sufi malfuzat, or that were explicitly offered to patrons, were written or copied in the high languages of Persian and Sanskrit—does this mean they reflect speech practices, or rather protocols of writing? Much path-breaking work is currently being done on Sanskrit-Persian interactions in the Mughal period,22 and questions like “did the Mughals (or sufis) really know Sanskrit?”, or “did they really speak in Persian?”, regularly arise. While the answers necessarily vary according to the educational capital and background of patrons and audiences, we must recognise that the multiple diglossia of the time means that texts written in the high languages existed in an oral context that was vernacular and multilingual. Once we are aware of these premises, we begin to see that texts that appear to exist in separate domains sealed by boundaries of script and literacy could and did circulate thanks to oral transmission, translation, exposition, and memorisation. We also see that at times the texts are themselves translations of oral vernacular tellings/performances. Thus Jack Hawley’s essay on Surdas’s reworking of a passage from the Sanskrit Bhāgavata-purāṇa shows us that the Brajbhasha poet-singer Surdas, traditionally memorialised as being blind, knew the Sanskrit canonical text well enough to riff on it and could expect his audience to understand his game.26 His quasi-contemporary, the poet Alam, declared that “since few listen to this tale in Sanskrit, I have bound [this tale] together in chaupais in bhakha”.27 Does he mean that he knew the Sanskrit versions of the tale? The case of ‘Abd al-Rahman Chishti’s Mir’āt al-makhlūqāt, analysed in Muzaffar Alam’s essay, is even more intriguing: the Persian text purports to be a translation of a Sanskrit Purana and its author declares and cites evidence of his knowledge of Sanskrit and of the text. The aim is to render public something that the keepers of the original text—the Brahmins—have tried to keep secret, i.e. that Shiva himself predicted the advent of Adam and the Prophet Muhammad and the takeover of India by their descendants, who intermarried with the local population. The text faithfully reproduces in Persian the generic conventions of the Purana—the chain of narrators, the explanation of past and future events, etc.—but what is the relationship of this text to orality? Were ‘Abd al-Rahman or his readers familiar with the Sanskrit text and/or oral expositions of the Bhaviṣya-purāṇa; did he sermonise on it; and if so in which language? Several essays in this volume seek to tease out the oral-performative dimension of written texts and genres, particularly those in the high languages or whose accessibility is uncertain. Taken together, the contributions of Busch, Schofield, Sharma, and Khan show that texts that have come down to us as part of separate and sophisticated traditions—Brajbhasha riti poetry, Hindustani music theory and song lyrics, and Persian poetry and storytelling—were all consumed by the same people at the Mughal court. Thus, while seeking to understand the logic internal to the formation and transmission of each archive (courtly and madrasa Persian, Jain, courtly bhakha, bhakti, sufi), it has been crucial for us to also question their limits and exclusions, and to place them within the larger framework of orature and oral transmission.28 An approach sensitive to oral circulation and performance highlights the dynamics through which these connections took place. The result is a map of a richer and more densely interconnected cultural and social world. A major advantage of a multilingual and intermedial approach to orality and performance traditions is that it allows us to explore literary culture beyond the court, to understand the links between forms and performers outside and within the court, and to examine the dynamics of classicisation and popularisation. It also allows us to attend to the oral-performative aspects of poetic culture and wit, so obviously valued as cultural assets (see Pellò in this volume), and to consider the performers who enacted/produced these verbal forms, their social position, their self-presentation, and their own mobility. Ever since Françoise “Nalini” Delvoye’s pioneering studies of dhrupad texts in Persian sources, of the circulation of songs and of song-poets (vaggeyakar) from the court of Gwalior to that of the Sultan of Gujarat and thence to Akbar’s court and sub-imperial centres, and of the relationships between Tansen, Swami Haridas in Vrindaban, and Muhammad Ghaus Gwaliori, we have been alerted to the intense circulation of songs, musicians, and musical knowledge between courtly and devotional/ritual domains.32 The striking flexibility in song themes and “retooling” of song texts as well as poems, so that a ruler’s name could be substituted by another, or by the name of Krishna, were a direct consequence of this circulation, as Busch reminds us in her essay. Allyn Miner’s essay shows how much of that musical knowledge was already cultivated at pre-Mughal courts such as the Sharqi court in Jaunpur, and how the musical knowledge codified there and in other apparently peripheral locations such as Rewa34 circulated among three different kinds of constituencies: one made of connoisseurs and music specialists who wanted to learn the specific qualities of each raga; another constituted by those who only wanted the basic vocabulary and took pleasure in the imaginative aspects of raga visualisation; and a third one made of practitioners and religious devotees who employed a more restricted range of ragas for ritual singing. Several essays tackle performance texts and traditions at regional courts (Miner, Busch, d’Hubert, Orsini). Orsini’s traces the emergence of kathas or tales for local courts such as the Baghela of “Amarpur” in the wake of epic and Puranic retellings. Allison Busch’s pathbreaking work has shown how riti poets like Keshavdas, working in the small court in Orchha, created a new literary culture in the early sixteenth century by carefully studying Sanskrit models and reproducing them in the vernacular.35 She has also shown how, in the wake of political alliances between local rulers like the Bundelas of Orchha and Mughal princes, this literary culture spread into the heart of the Mughal imperial court and found ready patronage not only in the imperial entourage, but also among its ministers (like Todar Mal, whom Alam also mentioned in admiring terms in his 1582 Mādhavānal Kāmakandalā) and Rajput mansabdars, and who in their home territories developed their own sub-imperial courtly cultures and employed their own array of poets, genealogists, and storytellers.36 In her essay for this volume Busch focuses on the oral and performative dimensions of this literary culture in the form of memorising verses and rules as a necessary preparation for extempore poetic performances, of the retooling of verses by itinerant poets for successive patrons, and on the functions of poetry at these courts, including the performance of martial poetry on the battlefield itself, with the expressed aim of enthusing the warriors. Nor should we forget that these local rulers were also major patrons of ritual and devotional performances and sponsored a whole range of temples, monasteries (maths), and festivals.37 A particularly interesting case is that of the sophisticated seventeenth-century poet Alaol, the subject of Thibaut d’Hubert’s contribution, whose Bengali narrative poems/romances were informed by Persian, Sanskrit, and Hindavi poetics and literary models. The case of Alaol points to a kind of cosmopolitanism that was directly produced by the confluence of multilingual literary traditions, translated into the local literary language for a small but heterogeneous court in Arakan (now Myanmar). Widdess’s essay also touches on the circulation of North Indian musical and literary culture at the Malla court in Nepal. Not only did sangitashastra texts circulate there, but it is also here that some of the earliest manuscripts are to be found. He further notes that some of the Malla kings’ dapha compositions are present in contemporary dapha songbooks—a tantalising “tenuous textual continuity can thus be demonstrated between the early seventeenth-century palace context and twenty-first-century farmers’ music” (p. 234)—while the wonderful detail in his Figure 8.3 shows how non-courtly genres and performers were visualised in a hierarchical spatial fashion. Several other essays focus on urban spaces and activities among a range of merchant, service, professional, and artisanal groups. Stefano Pellò shows how tazkiras of poets written in Persian from the eighteenth and nineteenth centuries focus on the activities and the professionalisation of contemporarypoets and their disciples outside the court, in the urban spaces of Delhi and Lucknow, and in doing so eulogise and canonise them. But these texts also display keen interest in humbler and more marginalfigures in the urban landscape such as madmen, opium-addicts, jesters, and street performers. John Cort’s essay focuses on the parallel world of Jain laymen in Mughal Agra, who met regularly in a temple courtyard and constituted themselves into debating circles that produced newly-authoritative doctrinal and liturgical texts and virtually emptied the figure of the bhattarak of authority.38 This was a process of vernacularisation of knowledge that happened independently of royal initiatives or patronage, the fruits of which are still part of Jain ritual practices today. Novetzke’s essay on kirtan performances and Widdess’s on dapha both straddle premodern texts and contemporary performances and include urban ritual performances among artisanal/subaltern groups, while Richard Wolf’s takes us to the diasporic urban streets of Karachi for rhythmically sophisticated perfomances of Nizami drumming. With the essays by Horstmann, Novetzke, Hawley, Bangha, and Alam we are taken to spaces that range from small-town (qasba) sufi establishments and villages, maths, and festivals (mahotsav)where Dadupanthi acharyas would deliver their sermons.39 The great circulation of Surdas’s songs and Bajid’s arilla verses, and of manuscripts with Bajid’s short, humorous tales, points to a popular realm of religious, entertaining, and instructive performance that would definitely include Novetzke’s kirtans, which nowadays usually comprise “a story from the life of a sant that goes along with the song, and usually other songs or texts are brought in that can range from Sanskritic philosophy to sufi mysticism to the wisdom of political leaders and popular adages and sayings of unknown provenance in any language, including English” (p. 171). That Bajid’s manuscripts are also held in royal libraries like the Pothikhana in Jaipur alerts us to the fact that, just as there is a sophisticated oral knowledge that does not depend on literacy (Hawley, Wolf), so elite tastes could and did include popular genres. Conversely, the career of the early-seventeenth-century Iranian émigré storyteller Fakhr al-Zamani shows the remarkable mobility from urban to courtly spaces of both performer and genre. “If Fakhr al-Zamani’s progress is any indication, qissas that began at the ‘popular’ level could, given a chance and perhaps with some stylistic alterations, eventually be performed in the courts of nobles and preserved as manuscripts in their libraries”, notes Khan (p. 192). And while his gestural style of storytelling recalls the figure of the naqqal, a professional actor who conveyed “a story with words and actions, attempting to embody the narrative and its characters”, Khan reminds us that naqqals were lower on the scale of professions than qissa-khwan,40 and Fakhr al-Zamani never used the word naqqali for what he did (Khan, p. 198). Because of the challenges outlined above, we considered it to be vital to bring ethnomusicologists and scholars of contemporary performance practices into conversation with the more historically-oriented among us. We do not wish to suggest naively that contemporary performances reflect past practices. But what their study reveals holds great imaginative power for historical work. For example, contemporary ethnographies show us a consistent combination of recitation of oral/written text with extempore exposition (arthav or, in raga performance, vistar) right across the genres and contexts we are looking at.41 For the earliest tales, the text is indeed all we have; but were any of these tales—particularly those rich in ritual, technical, or esoteric meanings—accompanied by exposition? It seems likely, particularly in cases where the length of the stanzas and the narrative “density” in extant copies vary.42 There are, for instance, obvious markers of ritual beginning in most of our texts—but how much richer is Philip Lutgendorf’s description of kathavachaks (called Vyasas in this instance) taking their seat after worshipping the seat and garlanding the book, etc., in katha performances of the Rāmcaritmānas!43 Christian Novetzke makes the useful distinction between “didactic kirtan” (which includes a wide range of modes, as we shall see) and “ecstatic kirtan” on the basis of the protocols of sitting and standing. In the ecstatic “Varkari kirtan” everyone stands and dances, whereas in the other forms of kirtan only the performer (kirtankar) stands while the audience sits, though the audience still participates in many ways, “singing along with the songs, finishing well known verses along with the kirtankar, sometimes interacting with the kirtankar, and so on” (p. 172). In many cases, all we have for past musical performances are musical treatises or manuscripts with song texts. Mukund Lath and Winand Callewaert have argued that the form in which the song-texts are collected and ordered in a manuscript can tell us whether it was a singer’s own workmanlike collection or a systematisation, e.g. for ritual purposes, though Miner in this volume suggests that the very presence of a raga in bhakti texts indicates, at the very least, “that the original compiler or composers moved in or were connected with court or temple circles” (p. 399). Christian Novetzke has made a crucial distinction between formal pothis and informal badas (more on which below). In the case of the book used in dapha performances, we could muse over the meaning and interpretation of the song texts, were Richard Widdess not to tell us that in dapha performance sound and key words and effort are much more important than the text. The conference from which this volume draws was originally entitled “Tellings, Not Texts”, but one participant pointed out that “Tellings and Texts” was a more appropriate title, since texts—in their material form as books—were often present in the performances we talked about. What roles do texts play in performance, we asked, and what is the relationship between them? Which way does the directionality go—from text to performance or from performance/oral exposition to text? Here, too, early modern North India shows a great range of possibilities and choices. At one end of the spectrum, we see a great deal of interest in books as material objects. Already at North Indian Sultanate courts illustrated manuscripts (and illuminated Qur’ans) were valued and copied in Persianate and Indic styles and provide a tantalising glimpse of the circulation of shared tastes among elites that impacted, for example, upon Jain book-copying and book-dedicating practices.44 It is surely not by chance that the earliest illustrated manuscripts of the Sanskrit Bhāgavata-purāṇa also appeared in this period. The dazzling and profuse production of the imperial Mughal workshop (karkhana) has tended to absorb most scholarly attention, and we still await a comprehensive picture of illustrated book production in this period that devotes parallel and equal consideration to non-imperial manuscripts and book circulation. Among the religious groups of the period, too, we find a striking investment in books. The most obvious example is that of the pothis (compilations) of the early Sikh gurus. Guru Nanak himself, who “believed that he had been assigned by God the vocation of singing his praises […] and that his hymns were the result of direct communication from God”, nonetheless urged writing God’s name as a devotional act. This has been taken as an implicit hint towards the fact that already in his lifetime disciples wrote down his hymns in a pothi.45 As G.S. Mann points out, Guru Nanak referred explicitly to the role of the Qur’an in Muslim devotional life and must have been familiar with the practice common in sufikhanqahs of placing the Qur’an in the open to allow for full access.46 Having a pothi became crucial to the authority claims of his descendants and disciples at their various seats (gaddis). Textual history shows that the early pothis were subsequently added to, though much emphasis has traditionally been placed within the Sikh tradition on the singularity and unbroken continuity of the Guru Granth—whose status is very much that of a sacred text, to be read, recited, and sung to raga but also worshipped in private and public rituals. About Bengali mangalkabyas, d’Hubert notes that the poet is typically represented but as the conduit of the Goddess’s wish to tell the story. The ritual act by which he grabs a flywhisk marks not only the beginning of the performance but also the moment in which he remembers the text: “in terms of representation of the literary activity, it is not only that performance is the main way to share the content of a written text; rather it means that no text is ever able to come to existence without a setting of ritual performance” (p. 428). Courtly literary culture, Busch reminds us, was very much a written literary culture—she quotes a description of the court of Bir Singh Deo Bundela by Keshavdas in which “there sat countless writers writing, hundreds, and thousands of them” (p. 254). While her essay painstakingly teases out the performative elements and qualities of the poetic, historical, martial texts, and manuals written by Brajbhasha riti poets, she is also keen to stress that this “riti corpus was underwritten first and foremost by a textual engagement with the Sanskrit past”. Sunil Sharma points out that while history records that Akbar had Persian classics like the Shāhnāma and the Gulistān read out in court and these works were meant to be read aloud in sections, “their orality was accompanied by an equal value placed on these works as books, and it was usually through the copying and use of manuscripts of these texts that they were transmitted with the seals of the members of the royal family and nobility” (p. 288).